Are members of your organization or association intimidated by negotiations? Do they have a proven negotiating process, as well as negotiating skills training, experience, and expertise to negotiate a mutually beneficial Win-Win outcome? In today’s increasingly complex and competitive marketplace, effective negotiating skills training can be the key to organizational and personal success. People are negotiating all the time – in their personal and social lives and especially in their business lives. Negotiating is an essential, everyday life skill. Everyone can improve his or her negotiating skills. 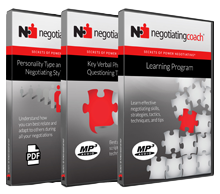 Having proven negotiating skills training provides members of your organization or association with a competitive advantage in sales negotiations, purchasing negotiations, procurement negotiations, legal negotiations, contract negotiations, supply chain negotiations, and much more. If members of your organization or association aren’t better negotiators than their counterparts, then they are probably making more concessions than they need to, thus leaving hard-earned money or value on the table – money that your organization can use to expand operations … invest in marketing and sales to capture a larger market share … increase shareholder dividends and employee benefits … and potentially strengthen its financial security.